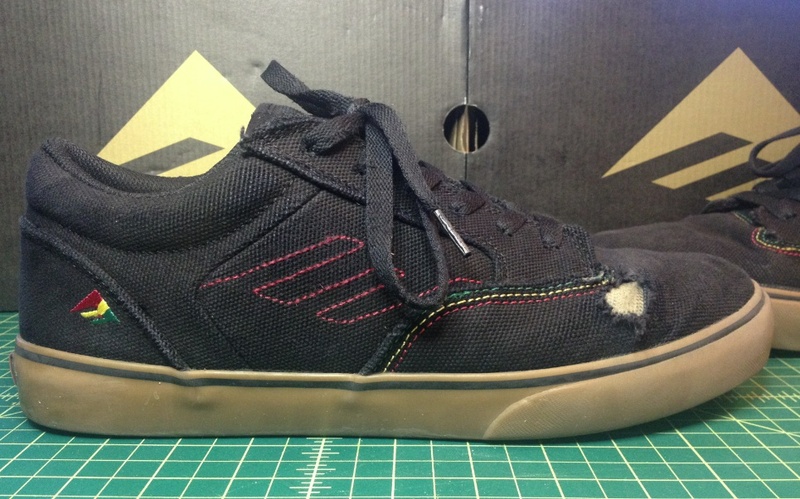 The Jinx is one of two vegan skateboard shoe from Emerica for the Holiday 2012 season. VSB started our skate review about 3 weeks ago and put in about 10 solid hours of skating. Combining a mix of the Reynolds 3 and the Leo, The Jinx comes in a 20oz Canvas upper with a traditional skate shoe style and some rasta flair. 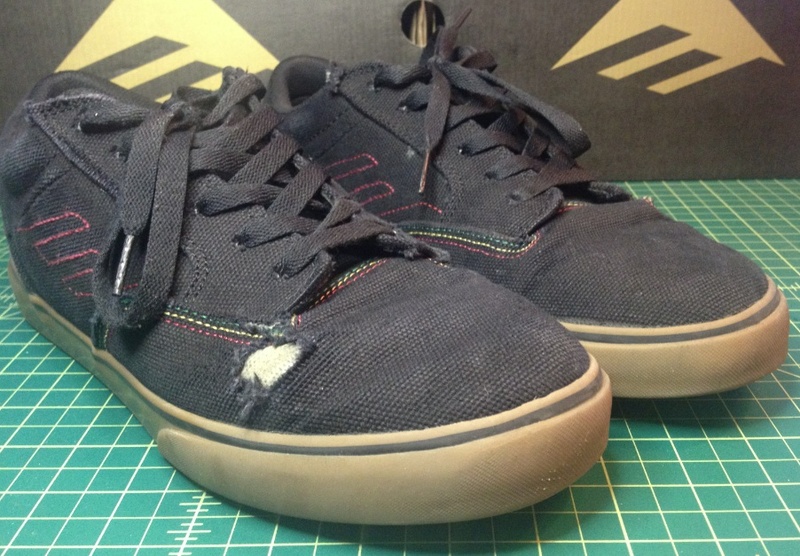 The solid toe caps and ollie area is wearing through and has held together really well. If you notice the off white patch you can see the inner latex lining. The 20oz canvas took long enough to break down. Now with this extra layer a patch of shoe goo could really stop the breakdown. Tempting. Looking at the soles, we have a couple of hot spots at the ball of the foot. With plenty of traction remaining it would appear the herringbone pattern is holding up well. The foxing tape is still thick around the toes and the heels are firmly planted. The STI Level 1 footbed is super cushy. Jump down just about anything with out worries of heal bruise. After the initial break in period the Jinx became super comfortable and responsive. 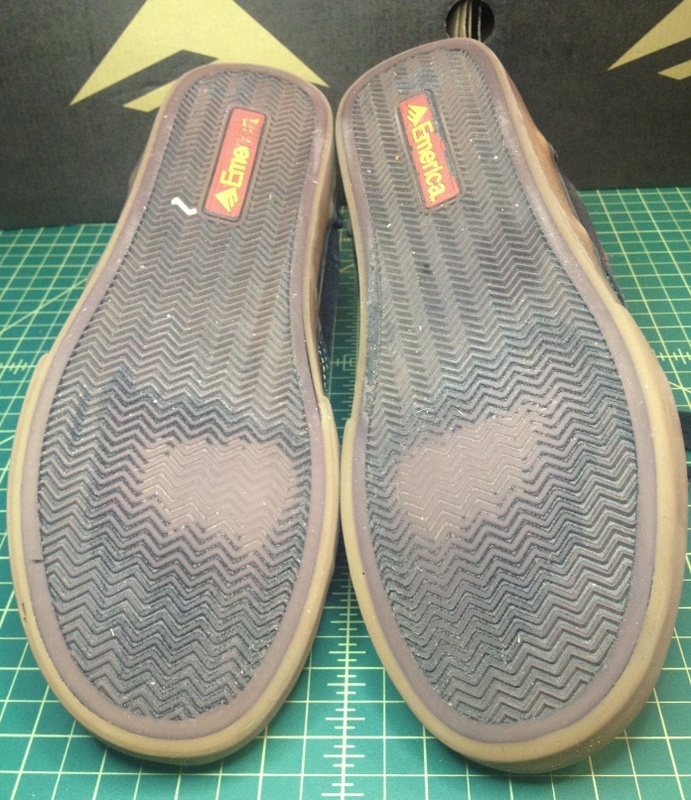 The thickness of the soles is certainly stiffer then the Laced. Over all it starts out feeling like a hefty shoe. The toes however have lots or room and feel well protected. The scoop and cupping around the heel keep the Jinx close when popping any trick, making you feel well connected to the board. The stiffness of the collar is an asset, though at first felt a little encumbering. After a few sessions it felt good to have the padding and made me more confident in trying some new tricks. The Jinx has been a pleasure to skate. I almost regret having to shred them into oblivion in the next few weeks. I wear a size 10 and they fit perfectly. Not to tight in the toes but my feet feel secure in them with out being squeezed. looks like they are holding up well. i’ve been wanting to skate these shoes since the first vegan colorway came out years ago.